Sustain critical process or life safety functions during severe weather. Sustain critical process or life safety functions with an unreliable utility supply. Disaster recovery, business continuity, emergency preparedness, etc. Does your local utility offer incentives for interruptible fuel delivery? What sorts of permits are required? Do you need to register the storage tank with federal authorities? Who decides when you operate your propane air system and for how long? 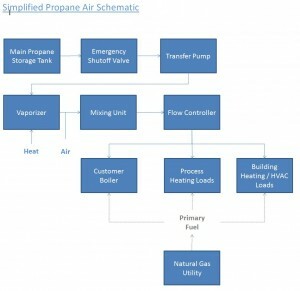 Who takes care of managing fuel inventory in the propane tank? Where should you site the equipment? Do you have the expertise to operate and maintain the equipment (i.e., is it part of my core business)? If a propane air project looks like a fit for you application, contact IEA and one of our experts can guide you through the project screening and development processes . IEA can own, operate and maintain your propane air project or provide a turnkey solution with asset management services to support ongoing operations and maintenance for projects owned directly by customers. Many utilities offer incentives for customers that are willing to take fuel delivery on an interruptible basis. These incentives can help pay for a propane air system.